The fifth installment of the Points Interview takes us on our first venture into biography as a dimension of drugs history. Here, we talk with Barbara Wallace Grossman, author of A Spectacle of Suffering: Clara Morris on the American Stage (Southern Illinois University Press, 2009). The work tells the story of the actress Clara Morris, whose morphine addiction is just one dimension of a remarkable, turbulent, and compelling life. Describe your book in terms your mother (or the average mother-in-the-street) could understand. 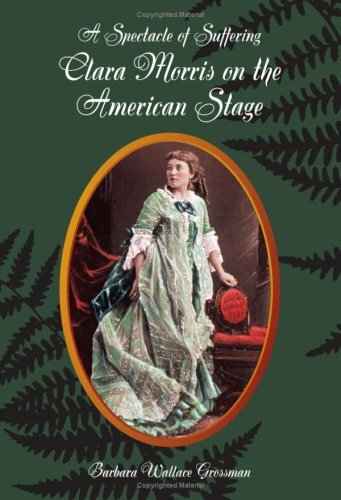 Largely forgotten today, Clara Morris (1847-1925) was one of the most renowned stars of her time, known as “America’s Greatest Actress,” the “Queen of the American Stage” and the “Empress of Emotional Acting.” Her mesmerizing performances riveted audiences as much as her tabloid-worthy antics intrigued them. Using Morris’s diary, memoirs, novels and short stories, as well as countless newspaper articles and secondary sources, I worked hard to present her story in an objective, yet compelling way. My book details the emotional intensity of Morris’s most celebrated roles, as well as her behind-the-scenes struggle with morphine addiction, theater managers who tried to exploit her, and a tyrannical husband. The moving story of her childhood poverty, abandonment, and abuse tells of her determination to become a great actress and her ability to channel her own suffering into her dramatic performances. Praised for her passion and power on stage, she was best known for the graphic realism of her acting and the particular effectiveness with which she played “victims of social usage.” In some ways she was like Judy Garland, staging comeback after comeback. Audiences cheered for her when she was well and had rebounded yet again from adversity. I use Morris’s own words as much as possible to capture her complicated experience and to illustrate her twin dreams of stardom and self-invention. When changing tastes and daunting health problems brought her stage career to an end, Morris turned to writing and enjoyed a second robust career as an author. The nine books and hundreds of short stories and articles she published capture her voice as a true feminist and a strong advocate for women in theater. Writing and speaking about her own experience as an actress, she encouraged other women to pursue the profession in which she had achieved so much and which, she believed, could bring them acclaim and honor. Although I judged Morris harshly at first, I came to admire her resilience and tenacity. Even after experiencing blindness and invalidism, the loss of her home, livelihood, and family, she did not succumb to despair and found comfort in the small pleasures of her circumscribed life. Her story is as much a tribute to the power of the human spirit as it is an effective means of exploring American theater and society in the Gilded Age. What do you think a bunch of drug and alcohol historians might find particularly interesting about your book? They’d be very interested in Morris’s addiction to morphine, which is something she never acknowledged publicly and never overcame, but which definitely was a factor in her artistic decline. Based on evidence I found in the diary, including a formula for “entr’acte injection of morphine” tucked in the back of one of the volumes, I was able to track her escalating drug use. In the chapter called “Morphined in Miss Multon,” I discuss her addiction as well as the larger issue of morphine use by women in the 19th century. I include many diary entries that document Morris’s reliance on morphine during performances and the alarming physical deterioration to which it apparently contributed. In a later chapter I cite other diary entries that show the impact the Harrison Narcotic Act (1914), which restricted access to opiates, had on her daily life. Now that the hard part is over, what is the thing YOU find most interesting about your book. That I kept my saga out of it and focused on Clara Morris’s! Although I know some biographers like to weave their own stories into their narratives, I wanted my book to be about Morris – not about my struggle to write about her. It took me a while, though, to figure out how do that in a compelling, readable way. When I started the project, I was very critical of her. I was disappointed in her for having stagnated as an actress, become a morphine addict, and lost so much of what she had sought to win. I began chronicling her life as a story of failure and disappointment. Not surprisingly, no one wanted to publish it! Disappointed by my own failure to find a publisher, I actually left the project for more than three years until a visit to the cemetery where Morris is buried brought me back to it. I was shocked to discover she shared an unmarked grave with her mother. That haunted me for several months during which I realized I had to return to my Morris project and finish the book. I re-thought my approach. I re-read the last few volumes of the diary and understood that even as an invalid, she was a person of great faith, optimism, and strength. I saw that I could focus on her capacity for dramatic reinvention, acknowledge her many creative accomplishments, and tell an upbeat story of resilience and tenacity. That’s exactly what I did. Every research project leaves some stones unturned. What stone from the project are you most curious to see turned over soon? A stone actually figures in my answer! It really bothered me that Morris and her mother were buried in Kensico Cemetery in Westchester, New York, without a marker of any kind on their shared grave. I tried at the time of my visit several years ago to get permission to install one but was told it was impossible because I wasn’t a relative. Last summer, while walking in the woods one day, I was thinking about Morris and decided to try again. I phoned, told one of the staff members about my request, encouraged her to look up my book on Amazon so she’d know I wasn’t a crank caller, and urged the Board to let me put a tasteful marker on the grave. Several weeks later, I got an email telling me the Kensico officers had agreed to let me do it. I feel as though the circle’s finally complete and Morris has the recognition she deserves. BONUS QUESTION: When Ken Burns makes a documentary of your book, who will do the voiceover? I’d choose Meryl Streep. As a person who’s often cited as one of our era’s greatest actresses, she’d certainly appreciate Morris’s story. I also love Cate Blanchett, but would rather go with an American actress because Morris, who had grown up in Cleveland, was criticized by critics in the 1870s for sounding too “American.” I’d like an American-accented voice to do the narration. I’m sure Morris would approve! Next Post → Are Drug Traffickers Re-Colonizing Africa?